"We are so sorry to hear of Joe's passing. Please know that you are in our though"
"You were always on my heart and in my thoughts and prayers. You will be missed, "
"It is with heart felt sympathy that I feel for the Loschiavo family at the loss "
Joseph Victor "Joe" Loschiavo, 53, a resident of Davidsonville, MD for eighteen years and previously of Bowie, MD, died on Sunday, September 23, 2018 at his home. Born on May 14, 1965 in Cheverly, MD to the late Rafael and Julia Loschiavo, Joe was an engineer with Telecommunication Systems in Annapolis, MD. Joe dedicated his life to the service of his community, especially to youth sports. 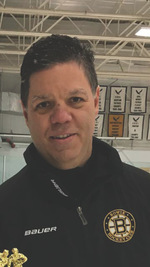 In addition to being the Bowie Ice Hockey Club President for the past two years, coach for Bowie Hockey Club for over 10 years, Joe was the former head of Southern Maryland Little League Baseball, head coach of the South River High School hockey team and a parishioner of Holy Family Catholic Church in Davidsonville. His impact on the lives of children is immeasurable and Joe will indeed be remembered for his kindness and love. He is survived by his wife of twenty-four years, Catherine Loschiavo; his sons, Nicolas, Camden and Jacob Loschiavo; his sisters, Janet Meyer of Odenton, MD, Lisa Callaghan of Grasonville, MD and Nina Savoy of Bowie, MD; his parents in law, Donald and Barbara Zukowski; his nephews, John P. Meyer, III, Connor, Liam and Ryan Callaghan; his nieces, Brittany and Ellen Steinmetz and Juliana Meyer; his great-nephews, Brooks Meyer and Jax Greska and his great-niece, Kaidence Greska. He was preceded in death by his parents, Julia and Rafael Loschiavo and his sister, Teresa Luna. Friends are invited to celebrate Joe's life at the Kalas Funeral Home, 2973 Solomons Island Rd., Edgewater, MD on Thursday, September 27 from 2 to 4 and 6 to 9 PM. Mass of Christian Burial will be offered at Holy Family Catholic Church, 826 W. Central Ave., Davidsonville, MD on Friday, September 28 at 10:30 AM. Interment Lakemont Memorial Gardens in Davidsonville. In lieu of flowers, contributions may be made to the Bowie Hockey Club, P.O. Box 2205, Bowie, MD 20718. Condolences may be made by clicking the link on this page.